Where was the Universal Declaration on Human Rights adopted? - Ask DAG! Where was the Universal Declaration on Human Rights adopted? On 10 December 1948, the Universal Declaration of Human Rights was adopted by the General Assembly in the "grande salle" of the Palais de Chaillot in Paris, France. The Palais is a theatre and the "grande salle" is its main room. 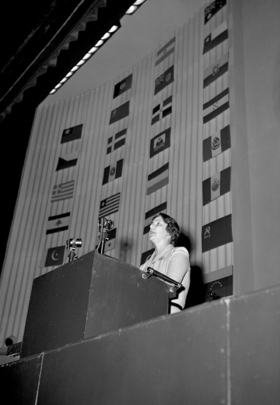 Picture: At Palais de Chaillot, Bodil Begtrup (Denmark), Vice-Chairman of the Third Committee of the General Assembly, addresses a plenary meeting prior to the adoption of the Declaration, 9 December 1948 (UN Photo/MB).